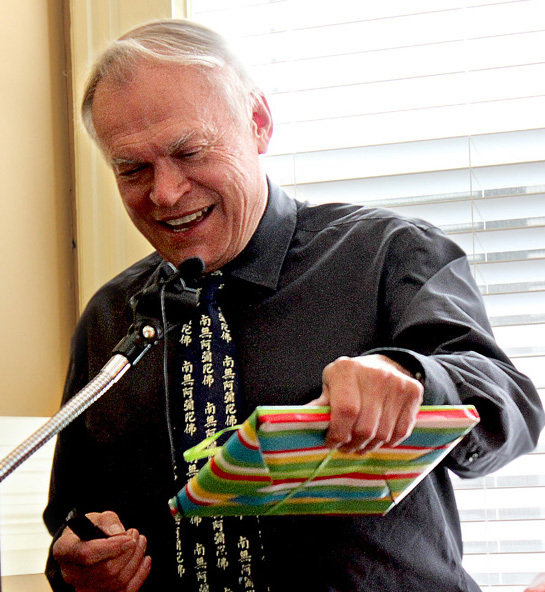 Barry Till, the Gallery’s Asian Art Curator Emeritus, was guest speaker at the May Gallery Associates’ meeting. He spoke about the archaeology of the Khmer Empire, concentrated on the most famous site at Angkor. When this magnificent 12th century city was ‘discovered’ in the mid 19th century, it was declared by the discoverer that the designer was the ‘Michelangelo of the East.’ Initially Hindu, the form and ornamentation of the various structures steadily became more Buddhist over the years – despite the efforts of one king’s daughter-in-law, a Hindu, who arranged for the destruction of more than a million carvings of the Buddha. The huge job of restoration of the overgrown and root-encased temples and pavilions has made great progress interrupted only by war – most recently from 1975 to 1993 by the Khmer Rouge. 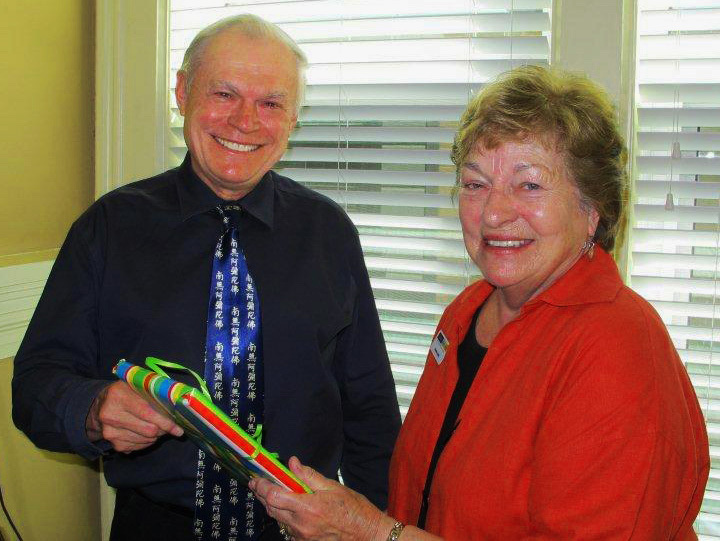 Curator Emeritus Barry Till and Donna Jones, President of the Gallery Associates. Barry’s presentation included many detailed historical photographs of temples, including his favourite, the Bayon at Angkor Thom, with its many serene and smiling stone faces. It was originally covered in gold leaf, as well as long bas reliefs depicting historical and mythological scenes. He also talked about LIDAR (light detection and ranging) equipment that has facilitated many recent discoveries at Angkor as it can penetrate jungle cover, and ‘picture’ the structures beneath. Since the signing of the UNESCO Accord in 1972, many statues and other artifacts from Angkor which had found their way into museums and private collections all over the world have been restored to their rightful place. Barry summed up his enthusiasm for the beautiful Angkor Wat in a self-described “rant,” comparing it to the unfortunate choice of Christ the Redeemer that edged Angkor out of the title of New Seventh Wonder of the World. Barry will curate an exhibition opening June 30, Remembering a Patron: Asian Art Donations by Dr. Judith Patt which will display a range of intriguing works. About 10% of the collection bequeathed to the Gallery by Judith Patt, a long time personal friend of Barry, will be included in this unique show, which the Gallery Associates will be sponsoring.